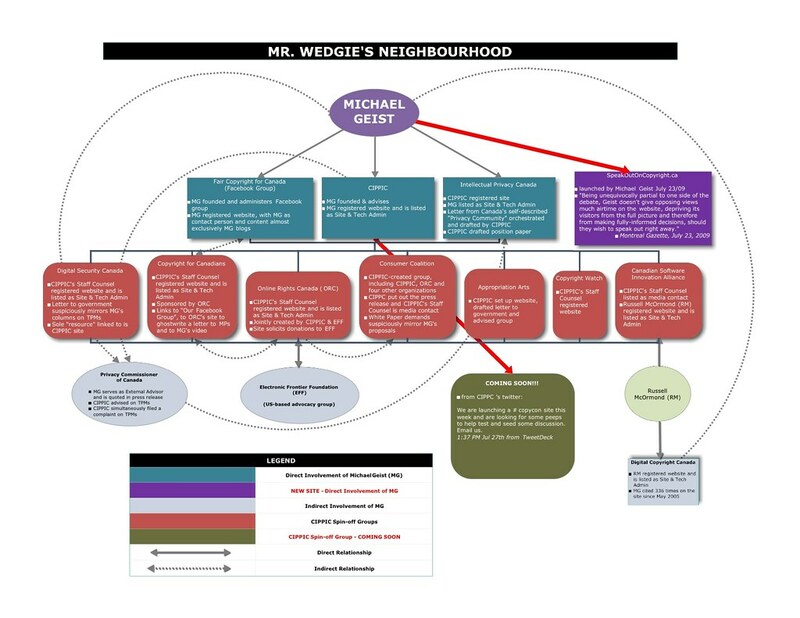 Michael Geist gave his robust analysis of the Special 301 process, perhaps as part of one of his many lucrative Lawbytes, Inc. contracts from bureaucrats at the Canadian Ministry of Industry or perhaps not? That connection is probably classified SECRET, so maybe we’ll never know. But Geist seems to think that the person we should be asking about what the hens think about the strength of the hen house door–is the fox. “As the U.S. prepares its 2010 edition [of the USTR’s Special 301 Report], for the first time it invited the public to provide their comments on the process and the link between intellectual property and trade policy. Among the hundreds of submissions, one from the Computer and Communications Industry Association [“CCIA“] stands out as critically important to Canada. The CCIA represents a who’s who of the technology business world, with a membership roster that includes Microsoft, Google, T-Mobile, Fujitsu, AMD, eBay, Intuit, Oracle, and Yahoo. While critics of Canadian policy might expect these business heavyweights to chime in with their own criticisms, they took the opposite approach. Let me boldly state–the chicken comes before the egg. And if the worldwide condemnation of Google Books is any indication, if the chickens disappeared the eggs would be missed. If you want to find out what the hens think about the strength of the door guarding the hen house that keeps out the foxes, who would you ask? Would you ask the hens what a hen thinks, or would you ask a fox what the hen thinks? In other words–they know nothing about the business they are doing their best to ruin. And then there’s Google. If CCIA does much to represent the interests of anyone but Google, I would be shocked. I first experienced the Kow-Tow Syndrome with tech types in Silicon Valley. The fundamental characteristic of KTS is that the victim subsumes their own personality with the views of a larger entity–because the larger entity must be right because they are big. For example, when negotiating a contract with AOL in the pre-disaster days (i.e., before the merger with a perfectly good media company that AOL ran into the ground), I noticed the agreement did not have an audit clause and I put one in. When the draft was returned to me, the audit clause was gone. I asked why did they take out my audit clause. I had a legitimate reason to ask for it as they were in control of certain information flows and we were not. I was told that AOL had decided that it was not a good use of AOL’s resources to allow themselves to be audited. I tried to fight this a few times but was finally told to let it go by the client. They are a big company so we have to do what they want was the rationale. My parting words to AOL: You can take it out but take some advice. Don’t ever buy a record company because you will never run that “*!X%” past artists. And a few weeks later they announced the merger. And that worked out so well for them. So when Geist wants to find out what the hens think, he might do better to ask a hen, not ask the fox what the hens think. Because bigger is not better, might is not right, and artists need all the protection they can get when faced with the Bad Boys of CCIA. Which is really just a lobbying arm of Google, and I don’t for the life of me understand why the other members pay their dues, which have to be gigantic sums. Don’t forget–artist rights are human rights, and if there’s one thing we know for certain, it is that CCIA member Google would not give a single Jimmy Chu from Marissa Meyer’s trousseau–a wardrobe worthy of a sartorial sister major label executive–to protect the human rights of the many creators who pay their part for the shoes. If you two Gulfstream families disagree, you can just wobble your wings. Ah, but that is what the Creative Commons is for. #NewMusic Weekend: Quiet Company, Twin Atlantic, Electric Guest, Reverend and the Makers, Blood Red Shoes Bunk about “Fair Use Industries” from the CCIA: What do Derek Jeter, Tom Adams and Ari Emanuel have in common?